This past weekend we visited my younger brother and his wife in NC and made these glorious treats. 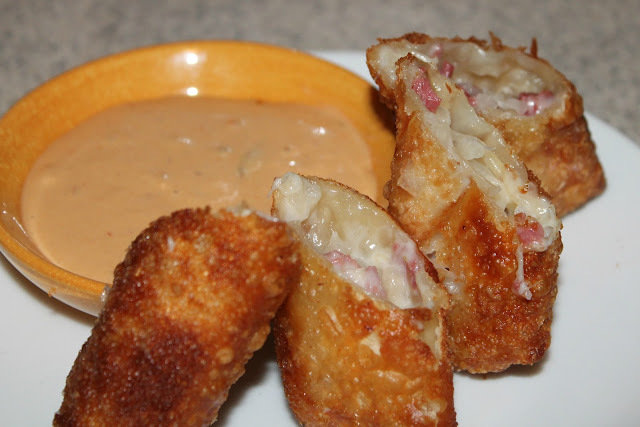 If you love Reubens as much as I do, these are heavenly. Just think...a deep fried Reuben...yeah, my mouth is watering for them right now. A few substitutions: we used Dijon mustard, corned beef from the deli counter, sriracha sauce, and doubled the recipe. I will say having a fryer makes the work so much easier- who has the time or patience to sit over a skillet? Is this something you would make for you or your family? Pinned and I'm DEFINITELY planning on making them! They look so tasty! Oh,I definitely want to try those!